Clare Chambers’ aim in this book is to find a way to mesh feminist and postmodernist insights about social constructionism with univeralist, liberal principles of freedom and equality to deal with enduring forms of gender inequality and injustice. According to Chambers, previous theoretical attempts by liberals and feminists (she would not regard those categories as mutually exclusive) to tackle gender inequality fall short because they treat choice as a ‘normative transformer’, which transforms an otherwise unjust practice or situation into a just or acceptable one (p. 21, p. 38). If women declare that they have voluntarily chosen something – cosmetic breast implants and female genital mutilation are examples typically discussed in the literature and in this book – then many conclude that a liberal state must not prevent them. Chambers would like to see these practices banned because she regards them as incompatible with gender equality and justice, and she believes that a liberal (or, more precisely, a perfectionist liberal) state can consistently do so. Her interwoven arguments toward this conclusion are complex, meticulous, and inventive, drawing on theories of, and debates about, social construction, embodiment, multiculturalism, political liberalism, the nature of autonomy, and the justifiability of paternalism. It is not possible to rehearse all of them in this short space. An overview of one strand of the argument will have to suffice. Based on the strength of her chapters (1–3) about social construction producing and constraining choices, Chambers argues that the state should intervene in gender unequal outcomes, even if they are the product of individual choices, if they meet two conditions, what she calls the disadvantage and influence factors: ‘Together, they express the idea that if an individual is encouraged to make choices that disadvantage her, then the ensuing inequality is unjust – particularly if the disadvantage is significant and enduring, and if the encouragement comes from those who make different choices and so end up better-off’ (p. 118). The upshot is that ‘many unequal internal norms of cultural and religious groups should be restricted by a liberal state’ (p. 118), including, for example, Orthodox Jewish and Muslim divorce law that permits men, but not women, to obtain a divorce without their spouse's consent, and the Catholic Church's ban on female priests. The mechanism through which individuals could challenge their community's norms and practices chambers calls an ‘equality tribunal’, which would be similar to existing employment tribunals charged with investigating discrimination in employment practices. Chambers compares her equality tribunal to the mechanism preferred by liberals in cases where women's equality rights conflict with multicultural rights – the so-called ‘right of exit’ – and argues that it is superior. One reason, she says, is because women are not then confronted with a stark choice between their culture or their equality. Rather, the equality tribunal, if successfully appealed to by a woman facing patriarchal norms, will enforce her equality within her culture: ‘if the culture is to survive at all, it must be in a modified form that enables all individuals to participate in it in conditions of equality…’ (p. 150). The book's resonances with Susan Moller Okin's (1999) famous – or infamous – essay are strongest in passages like this one. My admiration for the book exceeds my reservations, but I’ll start with what I regard as its weaker points. In places, Chambers gets bogged down in ground-clearing literature review that only the most patient (or obsessive) readers will enjoy. This happens, for example, in the Introduction, where, in my view, Chambers devotes too much space to Will Kymlicka's (1995) liberal multiculturalism and Seyla Benhabib's (2002) version of deliberative democracy – rehearsal unnecessary to understanding and appreciating her arguments in the subsequent 270 pages. On the other hand, I craved a larger, more general, critique of the claims of liberal neutrality and anti-perfectionism (a view widely held by political liberals who insist that the state must be neutral towards competing conceptions of worthwhile or valuable lives). I wished to hear more about how Chambers proposes to rebut those who would characterize her position as ‘femi-nazi’ – that is – as promoting a very limited set of ‘approved’ practices for women. In Chapter 2, she points to authors, such as Cass Sunstein (1992), who contest the claims of liberal neutrality, but much of this discussion is reserved for Chapters 6 and 7, which become much more technical and specific. The book's distinctive contribution, in my view, is its sophisticated articulation and defence of a form of feminist perfectionism. 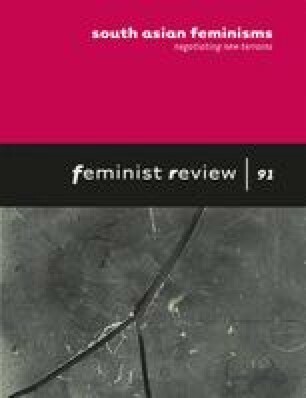 While Chambers shares with many feminists the worries about taking men's and women's choices at face value (since their choices often seem to reproduce gendered harms and inequality), not many bite the bullet and argue that the state must therefore sharply restrict those choices (exceptions are Yuracko (2003), and, less forthrightly, Levey (2000)). Discussions of how social construction works can sometimes be too abstract or general, so I greatly appreciated Chambers's use of the notion of ‘cosmetic knee implants’ to jolt readers into appreciating how thoroughly bizarre cosmetic breast implants are, in the absence of patriarchal norms and pressures: ‘Until breast implants seem as peculiar as knee implants, we cannot say that a woman chooses to have them for reasons divorced from patriarchy and thus that her decision is irrelevant to justice’ (p. 40). Throughout, Chambers's book draws fruitfully on two literatures – post-modern philosophy with its giants Foucault and Bourdieu, and analytic political philosophy with its giants Rawls and Raz (among others). These literatures are frequently kept separate in the academy and attract separate followings, but Chambers succeeds in bringing them to bear on one another. Plenty of feminists have tried to write books that have an impact on – in the sense of altering – mainstream, androcentric, liberal theory. But they have sometimes failed, perhaps because they are too dependent on jargon peculiar to gender studies, or because they do not engage enough with liberal theorists’ recent debates and preoccupations. Chambers' book deftly avoids both of these problems, so there is real potential here for this book to alter mainstream liberal thinking.